The Rev. Dr. Emilie Townes delivers the closing keynote address for the Migration and Border Crossings conference in the Campbell Hall Chapel at Columbia Theological Seminary on Saturday. (Photo by Rich Copley). DECATUR, Georgia (PNS) — The Rev. 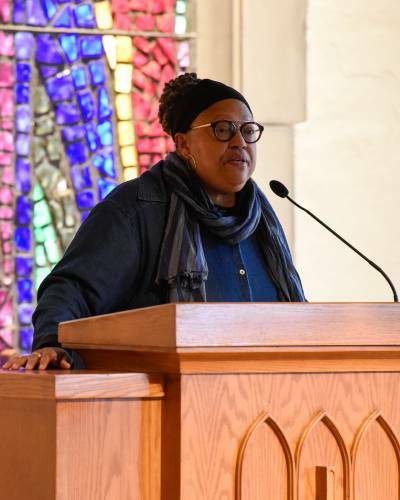 Dr. Emilie Townes brought last week’s Migration and Border Crossings conference at Columbia Theological Seminary to a close, summarizing what attendees had been hearing the past two days. “The times we are in are a hot mess or a post-modern, Shakespearian fresh hell,” Townes said during her closing keynote address Saturday afternoon. Summarizing a nation where tax cuts have been of little benefit to lower-income Americans and there are myriad reasons for people to protest, she noted the similar themes of theological conferences that were generating buzz in her home base at the Vanderbilt Divinity School: the one she was addressing, about immigration, and an upcoming conference at Princeton University, Christianity and White Supremacy: Heresy and Hope. The latter topic came up numerous times during the Columbia conference, particularly at the morning plenary session, Consequences of Migration, led by legal scholar Khaled Beydoun. In his talk, “The Roots and Rise of Xenophobic Nationalism,” Beydoun enumerated how the law helped establish the United States as a white Christian nation, despite the egalitarian rhetoric of some of the nation’s founders such as Thomas Jefferson. Beydoun spent a good portion of his talk focusing on the Naturalization Act of 1790, which limited naturalized citizenship to people who were white. While the act was altered and amended over the years, it was not until the Immigration and Nationality Act of 1952 that racial and gender discrimination were banned in naturalization. “One might say that the very raison d’être of the immigration law up until the Immigration and Nationality Act of 1952 was to first maintain the white homogeneity of the nation and later on … the European, Christian majority of the nation — themes that we see again in this ‘Make America Great Again’ white populist vision, today,” Beydoun said, referring to President Donald J. Trump’s campaign theme. But Republicans were not the only targets of Beydoun and his respondents’ critiques as liberals including talk show host Bill Maher and Trump’s 2016 Presidential election opponent Hillary Clinton were singled out for white-centric viewpoints. “Even if Clinton had won, Muslims would still be seen as a threat to national security,” Todd Green, associate professor of religion at Luther College in Decorah, Iowa said in his response to Beydoun’s talk. 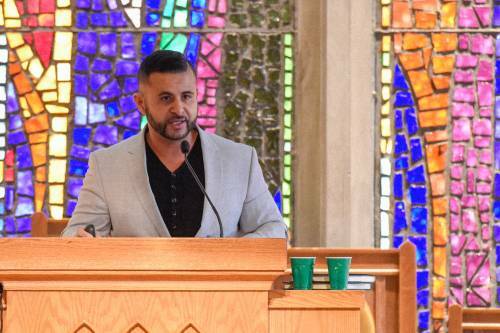 Green dismissed the notion that fear of Islam is based purely on ignorance of the religion, noting that some of its most virulent detractors know the religion very well. Islamophobia, he said, is a product of racism. “White people have failed to recognize the hypocrisy of casting Muslims as violent while overlooking our own violent past and construction of a war machine,” Green said, noting that white Christians were behind acts including slavery and the violent and deadly removal of Native Americans from their homelands, to name just a few. Townes concluded that the conference had demonstrated that, contrary to exclusionary visions of immigration, Christians are called to accept and aid people who are immigrating to the United States or other countries. Of course, the focus of the current national conversation is Central and South American migrants at the border between the United States and Mexico. “How do we welcome the stranger at our Southern gate?” said Townes, dean of the Vanderbilt Divinity School. “What fuels the fear and hatred and hoarding of resources that makes some folks acceptable migrants and others a dark horde of violence? “How do we … find a faith-filled theology and mythical muscle that we turn away from a lexicon of terror that creates social, political, religious and legal categories to include or exclude those who have been forced from their countries, from their homes, to escape war, persecution, lack of jobs or whatever? Part of what we point to when we fear displacement and trauma is what is wrong with us as much, if not more, than what is going on with the migrants. Townes pointed out that the profile of migrants at the Southern border has changed over the years from men seeking work to families fleeing violence and other threats at their homes. “The crisis at the border is a refugee crisis that is difficult, if not impossible, to fix with a wall,” Townes said, referring to Trump’s continued call for a wall spanning the Southern U.S. border. Townes said that to address the problem, the United States needs to address it as a refugee crisis with appropriate personnel and tools. She attributed stereotypical views of immigrants as “arrogant about its ignorance” and a sign of being hesitant to engage with the unfamiliar.